The village of Kismányok (German: Kleinmanok) has approximately 360 inhabitants and is located 45km northeast of Pécs in the southwest corner of Tolna county. The medieval settlement was depopulated during the Ottoman Rule (1541-1686). Between 1715 and 1720, Count Zinnendorf populated the region with numerous Lutheran German families. Florimund Count of Mercy, the later landowner, continued the settlement. Thereby, the number of inhabitants, most of them Lutheran families from Hesse, grew steadily. 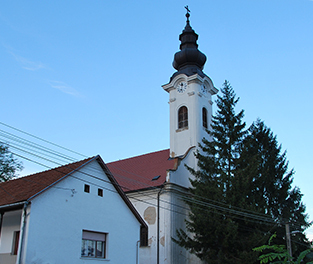 Kismányok remained a Lutheran congregation until the end of the 18th century. The houses of the village were located in the valley of a brook which soon meets the “Völgységi” river. The first cartographic evidence (1782-1785) mentioned viticulture and woods on the hills surrounding the village. Also, two mills on the shore of the Völgységi are recorded. After Josef II had issued a patent of tolerance, the small prayer house was replaced by a church which still exists today. The foundations stone was laid in 1785 and the building was finished in 1790. However, it was not consecrated until 1801. In 1828, the village comprised of 68 residential houses and 507 inhabitants. Eight of them were Catholics, eight Israelites, all others were of Lutheran faith. 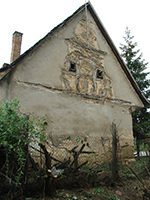 In the southern part of Kismányok (towards Hidas) on Petőfi Sándor Street 28, the oldest known half-timbered house of “Swabian Turkey” can be found. It is easily recognisable: it is located on a hill and sits on a metre-high base of natural stone. The walls are made from clay bricks. According to local legend, the landowner had given natural stones from his own estate to the German colonists so that they could build secure fundaments for their homes. The half-timbered gable bears the following inscription: MARTIN HESS ANNO MDCCLXXIIII. Thus, both the first owner as well as the year of construction (1774) was recorded. The name of Hess can be found amongst the first colonist families of Kismányok. The family came from Büssfeld in upper Hesse in 1721. 1723, several members of the family moved to Bonyhád. Henrik Hess, also from Büssfeld, came to the neighbouring Majos in 1737. His son Johann Henrik junior was baptised in the protestant church of Kismányok in 1737. It can be presumed that Martin Hess, owner of the half-timbered house, was an offspring of the big Hess family. Since 1744, the house has been altered many times. 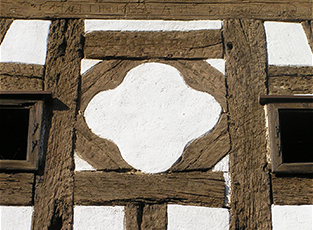 The half-timbered structure was hidden behind a coat of plaster. After careful restoration in 2005, the current owner is now using the precious historic monument as a guesthouse. The protestant church from the 18th century. 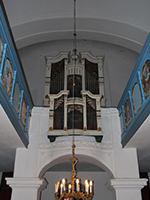 LEFT: The beautifully restored organ was built in 1808. RIGHT: Gable before restoration in 2005. The beautiful half-timbered structure bears its erector’s name. 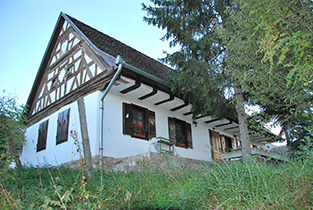 After an excursion of the region, one can spend the night in the 18th -century half-timbered house.